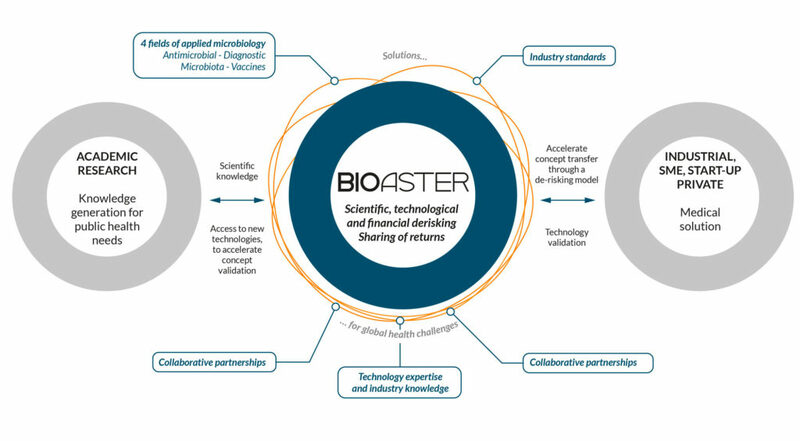 In between the phases of the acquisition of knowledge and providing the solution for the patient, BIOASTER wants to act as a bridge between the academic and private spheres, technological added value in microbiology, an agile and collaborative organisation that reduces the risks associated with innovation. The first is scientific. This consists of the exploration, that has barely even begun, of networks that control billions of interactions between “stakeholders”: pathogens, immune cells, microbiota, environmental factors, diet, etc. The second is technological. By combining the “omics”, imaging and predictive models with greater computational power and storage, systems biology provides us with tools that are increasingly accurate, in order to understand and manipulate these networks when in a “normal” state and when under threat from illness. The last is medical. This entails the birth of participatory, preventive, predictive and personalised medicine, from the lab to patient bedside, in order to understand both the disease and health.